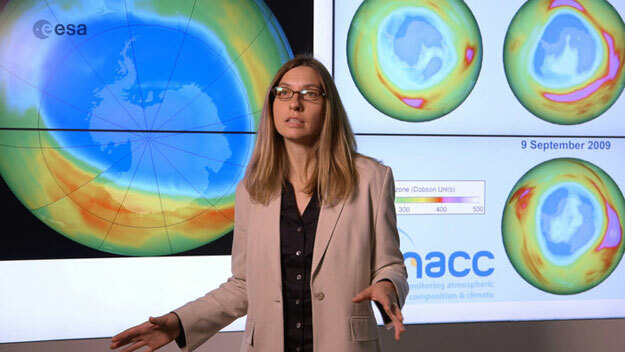 Registration is open for a free online course that provides an introduction to monitoring climate change using satellite Earth observation. ESA has teamed up with FutureLearn, a leading online learning platform, to offer the ‘Monitoring Climate from Space’ course beginning on 8 June. From their vantage point some 800 km above Earth, satellites provide crucial information on our planet’s land, oceans, atmosphere and ice. This information gives us a view of the current state of our climate, and allows us to detect changes over time. The course will focus on the role of satellite data in supporting decisions relating to climate change and sustainable development. It is designed for current and future policy-makers, educators, climate communications professionals and the wider public. Particular attention will be given to data from ESA’s satellite missions, including CryoSat, SMOS, GOCEand the Sentinels, and use information from the Climate Change Initiative. Seventeen educators from leading scientific universities and institutions will guide the virtual classroom over the five-weeks course. Discussion of course material with the educators and other participants will also be possible. “In today’s increasingly knowledge-based world, putting learners in touch with experts in their chosen field is an essential part of any education programme. I am honoured to welcome ESA to the FutureLearn partnership,” said Simon Nelson, Chief Executive of FutureLearn. So far, over 3300 people have registered for the course. This is ESA’s first massive online open course – or MOOC – and was designed with the help of Imperative Space. The course is part of ESA’s ‘EO Science 2.0’ initiative, which explores challenges and opportunities faced by the Earth observation scientific community in responding to advances in communication technologies. The first Science 2.0 conference will be held 12–14 October.